Is there a more diverse electronic music producer than John O'Callaghan? 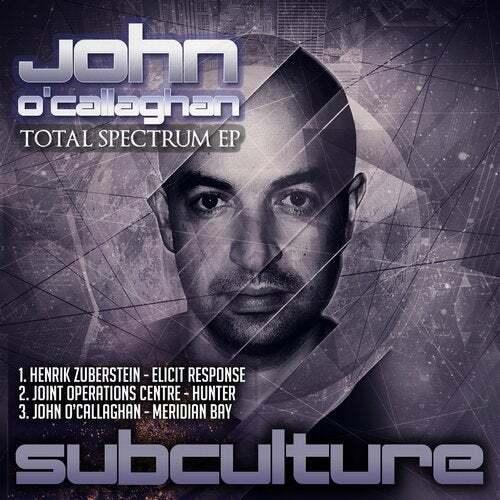 Exploring the full realm of his astute productions, Subculture is proud to present the Total Spectrum EP showcasing the unique sounds of Henrik Zuberstein, Joint Operations Centre and John O'Callaghan. Entering the deep realm Henrik Zuberstein takes you on a trip with Elicit Response. The hypnotic grooves and kaleidoscope of dreamy progressive sounds continue to build momentum throughout the whole production. Cattaneo, Mantzur & Guy J approved. Taking things into the melodic realm John O'Callaghan ups the ante with Meridian Bay. Yet again he demonstrates the true artistry of pumping melodic trance music with a truly classy production. With a sublime yet haunting break and infectious lead melody underpinned superbly by John's Midas trance touch, Meridian Bay is guaranteed to quickly become another stadium sounding John O'Callaghan fan favourite. Ending in the darker realm, Hunter encapsulates all that is Joint Operations Centre. Pounding drum rhythms, edgy tectonic grooves and an oddly trippy breakdown ensures that Hunter is a tech-dance weapon. Bryan Kearney & O'Callaghan have played this exclusively in recent sets.